Brother Rock written by Randy Gabbard, drawn by Guy Gilchrist & colored by Philip A. Buck. Hello again! This week, I'm excited to share that I was recently hired by none other than Guy Gilchrist to color a comic strip he's currently working on. Yes, that Guy Gilchrist, cartoonist of Nancy, The Muppets and much much more! Brother Rock (written by Randy Gabbard, drawn by Guy Gilchrist,) before I colored it. The second Brother Rock (written by Randy Gabbard, drawn by Guy Gilchrist,) before I colored it. 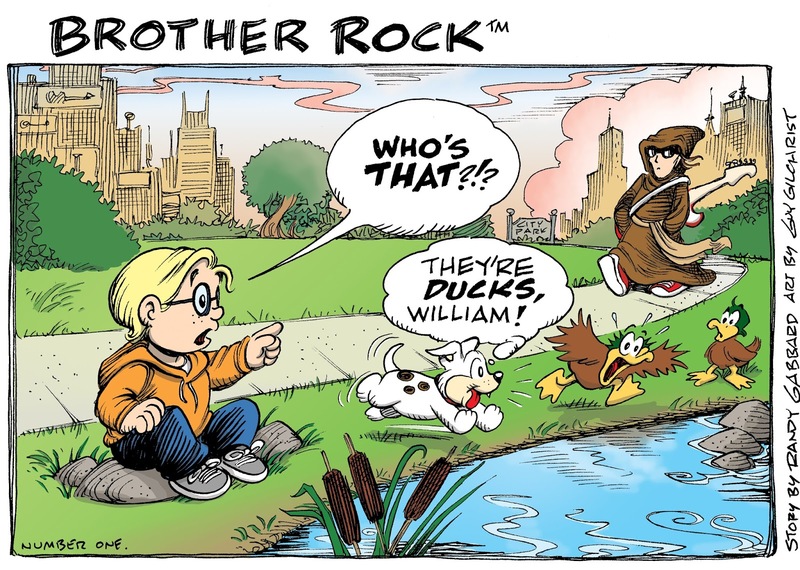 The second Brother Rock written by Randy Gabbard, drawn by Guy Gilchrist & colored by Philip A. Buck. I did the work in Photoshop & have uploaded the RGB (web friendly) versions here. Once I know more about where you can follow the strip, I'll let you all know. My understanding is that it will be bimonthly, but don't quote me on that! haha If you have a project you'd like the Guy Gilchrist Art Studio to help with message the Facebook page or call 615-625-8001. And as always, if you'd like to inquire about work that I can do for you, contact me through my email listed in the side bar & contact page or through my online custom art shop. Thanks for taking a look! God bless! May The 4th Be With You - Star Wars Art For Sale!